Yalli (Kochari, Tenzere), traditional group dances of Azerbaijan’s Nakhchivan Autonomous Republic, have been included in the UNESCO List of Intangible Cultural Heritage in Need of Urgent Safeguarding, reads a joint statement by Azerbaijan’s Ministry of Culture and the Foreign Ministry. The document on this nomination was presented with the joint cooperation of Azerbaijan’s Culture Ministry, the Foreign Ministry and the Permanent Delegation of Azerbaijan to UNESCO. The mentioning of namely Nakhchivan in the document is aimed at promoting on a global scale the traditional culture and folk art of the population living in this ancient historical region of Azerbaijan, and at the same time is aimed at protecting these traditions at the UNESCO level, reads the statement. 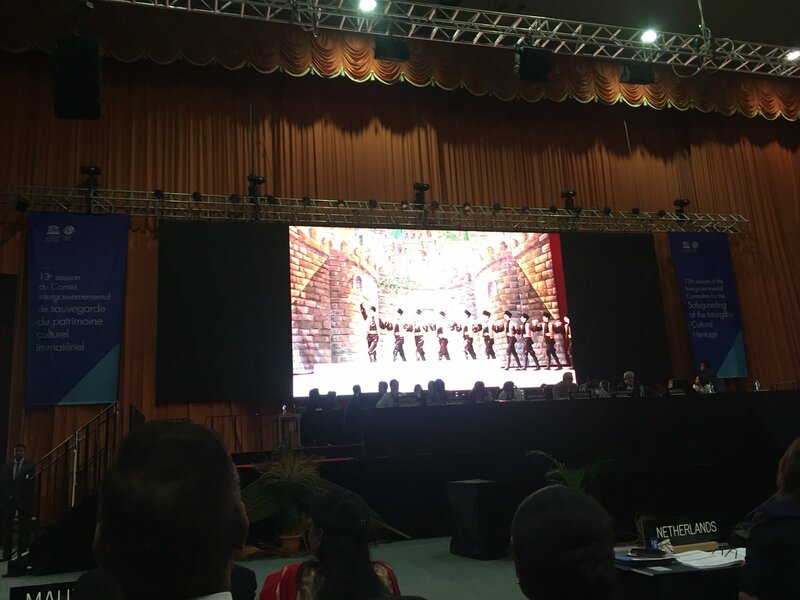 Also, just like in cases with other cultural heritage nominations of Azerbaijan, Armenian provocative attempts regarding the nomination of Yalli (Kochari, Tenzere) traditional group dances of Nakhchivan were suppressed, the statement said. In anticipation of the session, the relevant state bodies of Azerbaijan conducted the necessary work, and during the session, the Azerbaijani delegation gave a worthy response in this regard to the Armenian side. Besides, the UNESCO Representative List of the Intangible Cultural Heritage of Humanity has included the art of crafting and playing kamancha (a bowed string musical instrument), the tradition of cooking and serving dolma (meat and spiced rice wrapped in vine or cabbage leaves), the performance of Azerbaijani mugham (a folk musical composition), the tradition of cooking and serving lavash (a soft, thin unleavened flatbread). The list also included Azerbaijan’s Lahij copper craft, ashig art (combines poetry, storytelling and traditional instrumental music), Novruz holiday, the art of carpet weaving, kelaghayi (traditional Azerbaijani women’s headgear), the art of playing tar (stringed musical instrument), while Chovqan, the traditional Karabakh horse-riding game, has been included in the UNESCO List of Intangible Cultural Heritage in Need of Urgent Safeguarding. All this was done with the support of Azerbaijan’s first vice-president, president of the Heydar Aliyev Foundation, UNESCO and ISESCO Goodwill Ambassador Mehriban Aliyeva, who has a crucial role in developing cooperation with UNESCO, preserving and promoting the cultural heritage of Azerbaijan on a global scale. 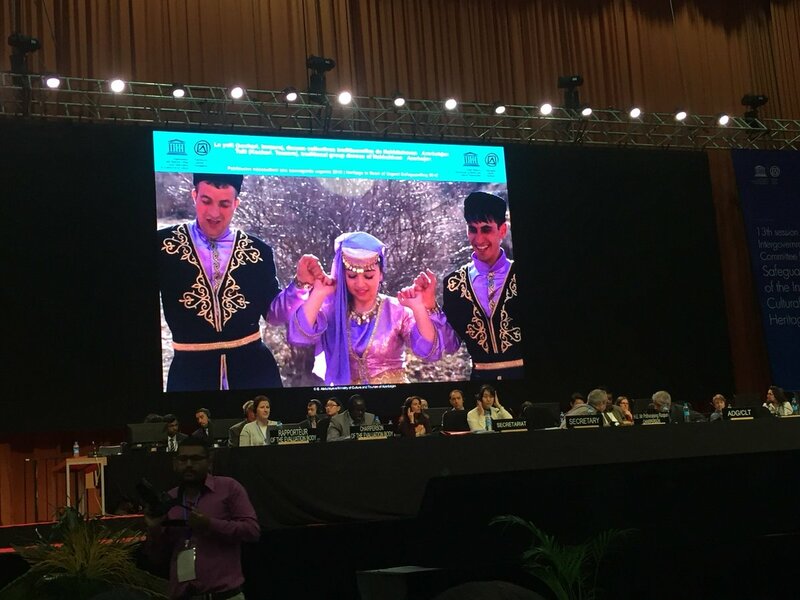 UNESCO has inscribed Yalli (Kochari, Tenzere), traditional group dances of Azerbaijan’s Nakhchivan, on its List of Intangible Cultural Heritage in Need of Urgent Safeguarding, UNESCO said in a message on Wednesday. 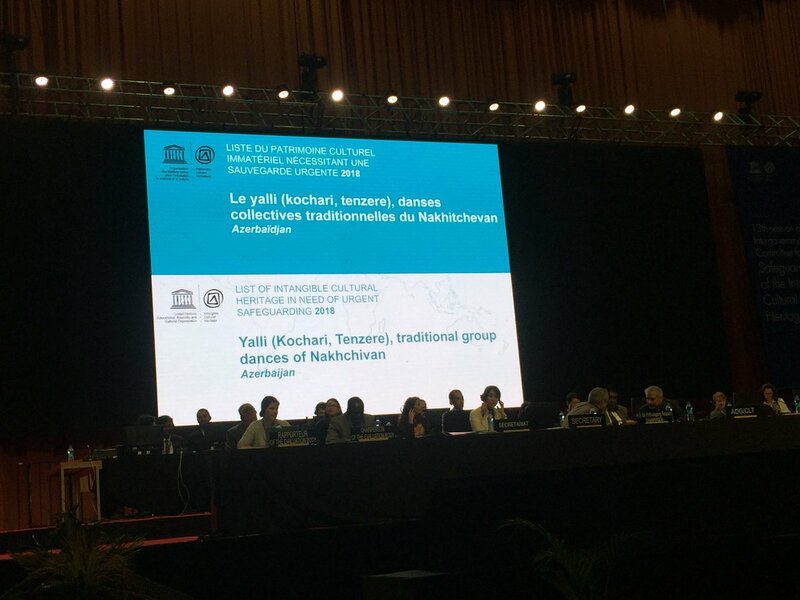 “After 2 years of hard work Yalli (Kochari, Tenzere) traditional group dances of Nakhchivan is inscribed to UNESCO urgent safeguarding list of intangible heritage of humanity. Congratulation to Azerbaijan and Nakchivan for this wonderful event,” Anar Karimov, Ambassador, Permanent Delegate of Azerbaijan to UNESCO, has tweeted.